I challenge you to a Christmas cookie duel! I think these are magnificent to give, receive, and just wow your friends and family with. 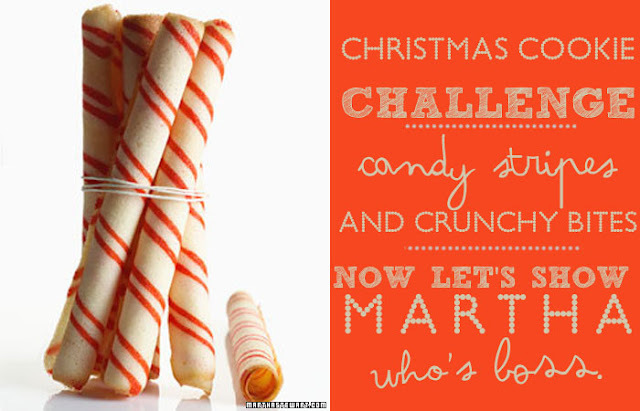 I can foresee scalded fingers, multiple failed attempts, and unladylike expletives hurdling from my mouth if I dared try Martha's candy stripe cookie sticks....I am positive that I will only curse the day Martha was born (BLASPHEMY!) if I give this recipe a whirl. So, I am going to pass the torch onto you, dear readers. Who is brave enough to attempt these swirly delights? If you will, I will....but I want to see pics as proof if you accept my challenge!!! I don't dare attempt that recipe...those cookies look too fragile for my baking skills! I will stick to my no-brainer Christmas cookie recipes!! love Christmas cookies!!! who doesn't? makes me excited for the holidays! I am so not brave! haha..Pls show us pics of how yours turn out though!! Those look delicious! Last year my sister and I made candy cane cookies, i think I may want to try these.